This Georgian mansion was built in 1771 for James Habersham Jr., one of Savannah's most important early cotton factors and founding-family members. The lot was originally a land grant from the British Crown. The building is a fine example of colonial architecture, and one of the few buildings to survive the fire of 1796. 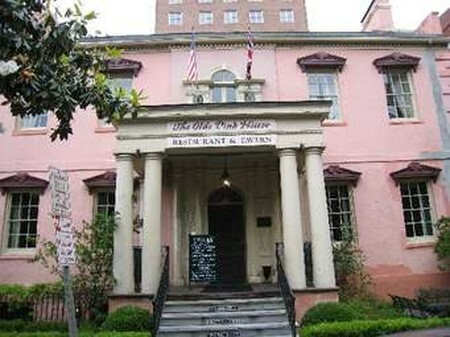 Savannah's Olde Pink House was so named for the beautiful shade of "pink" stucco, which covers its old brick. Of particular interest is the Greek portico with a beautiful Palladian window above. The fanlight over the front door is one of the oldest in Georgia. The interior features a lovely but simple Georgian stairway. The Bolton family, sister and brother-in law of architect William Jay, occupied the house from 1804 to 1812. Between 1812 and 1865, the house was home to the Planter's Bank and First Bank of Georgia. It also served as headquarters for Union General Zebulon York in 1865. One of the early restorations, it is now home to an elegant restaurant and cellar tavern beneath. The restaurant is well known for their romantic dinners.